The Busch und Muller Lumotec IQ Fly T has a bright 60 lux light output (upgraded recently from 40 lux output for older models) at night time with a well designed beam pattern. 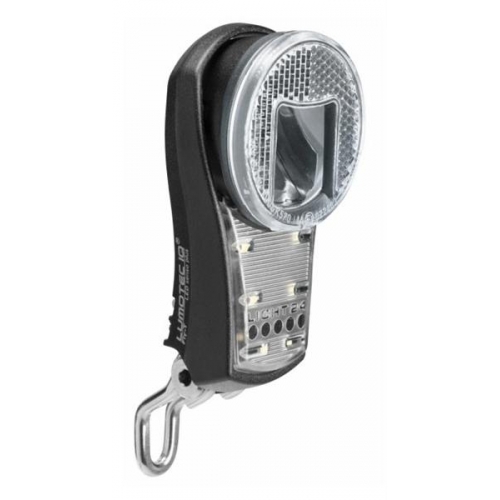 In daylight it automatically switches to a wider daylight lighting mode, reducing the brightness of the main output and lighting extra LEDs over a large area of the reflector. Due to the relatively large area lit during daytime, this is probably the most effectively implementation of day time riding lights on a bicycle headlight. The night mode is not absolutely the brightest, but it's still very good. Other features include standlight (light stays on when you stop) and manual switching as well as automatic switching. Can be used with any of our dynamos, though the automatic switching mode and daylight lighting make most sense with a hub dynamo. It can also be used in combination with any dynamo rear light and these are also switched on and off by the automatic sensor in the headlight. Read our blog post about combining dynamo lighting system components.